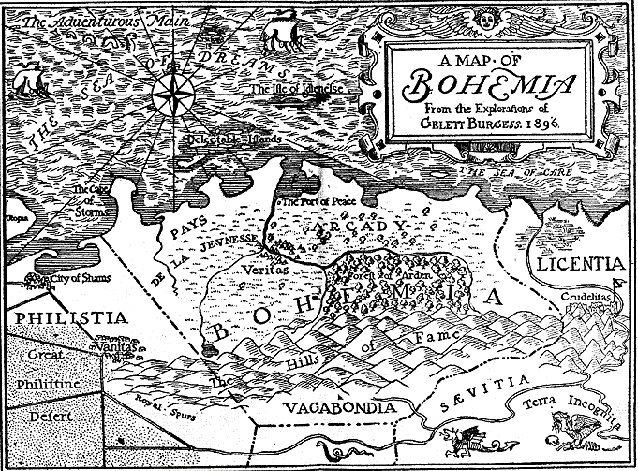 A map of "Bohemia" from 1896. The idea of bohemia caught the imaginations of writers in early San Francisco with Henri Murger's Scénes de la Vie Bohéme (1844), which depicted life in the Latin Quarter of Paris, where artists had been renouncing their bourgeois origins since the revolution of 1830 to live for love and a more egalitarian society. It was thought that Bohemia was the country of origin of Gypsies, who were regarded as an ideal nomadic community that flourished outside the constraints of established society. Murger's book enjoyed immediate popularity, and by the 1860s word of it had reached San Francisco writers. In those days San Francisco was a rapacious society that offered boundless opportunities for the savage exploitation of man and nature. There was certainly no literary canon; and literary expression took the form of exaggeration, hoaxes, and the kind of boisterous humor that reached its high point in Mark Twain's mining novel Roughing It. Many writers were manual laborers, shopkeepers, housewives, and transients; and the realistic narratives of pioneers and miners who survived the hazards of emigration and settlement were often so harrowing that they surpassed the wildest fiction. The city's earliest literature, then, was both democratic and anarchic; at the same time, the lawlessness of the city seemed to elicit from some of its poets a nostalgia for classical literary forms and an imagined lost civility of remote times and places, so that a vaguely Apollonian standard of order and proportion coexisted anachronistically with violent and macabre stories and homespun accounts of daily life. Literary carpetbaggers from the East Coast occasionally tried their hand at taming the literary frontier, but most left town in defeat, proclaiming the city illiterate, chauvinistic, and pretentious. Although class society in San Francisco bore little resemblance to that of Paris, the city's writers were not blind to the obvious attractions of la vie bohéme, and they reveled the nights away in Montgomery Street bars and restaurants. The popular press was full of references to bohemians. 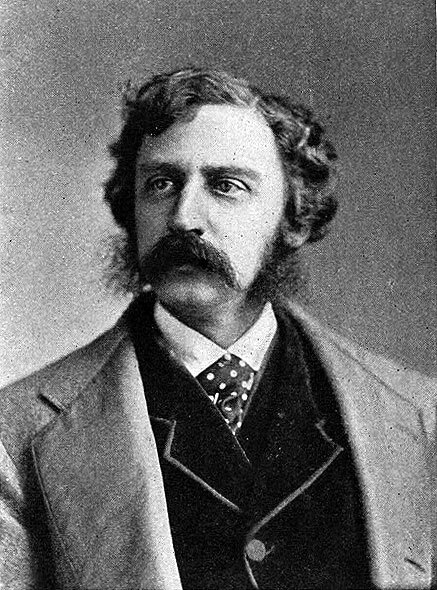 Before he struck it rich with his sentimental gold-field fables, Bret Harte used the pseudonym "The Bohemian" and even wrote a column of whimsical vignettes in The Golden Era called "The Bohemian Feuilleton". Although women intellectuals and writers such as poet and actress Ada Isaacs Mencken and journalist Ada Clare, who had been friends of Walt Whitman, found San Francisco appallingly provincial, they welcomed the sexual and social freedom the frontier town's literary scene offered. Another, later, bohemian community developed in the 1880s and 1890s around the intersections of Pacific, Washington, Jackson, and Montgomery Streets, where food was cheap and low-rent artist's studios were abundant. When the Montgomery Block building (at Montgomery and Columbus), which in the 1850s had been the center of business, banking, and mining speculation, emptied out as the commercial center moved south, artists and writers moved in. Over the years, more than 2,000 of them are reputed to have had spaces there, making the loss of this historic building in 1959 a black episode in the city's cultural history. (The Transamerica Corporation Pyramid now occupies the site.) Some of the notable writers and artists who lived in the Monkey Block were Ambrose Bierce, Joaquin Miller, George Sterling, Jack London, Sadakichi Hartman, Frank Norris, Yone Noguchi, Margaret Anderson, and Kenneth Rexroth. Frida Kahlo and Diego Rivera lived there while Rivera was painting the allegory of California's riches on the ceiling of the California Stock Exchange (now a tiny private luncheon club).